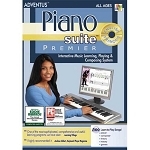 Learn How to Play Piano Today with Piano Lessons from the Leader in Beginner Piano Software. Learn how to read music, play piano chords, and much more with this complete method. 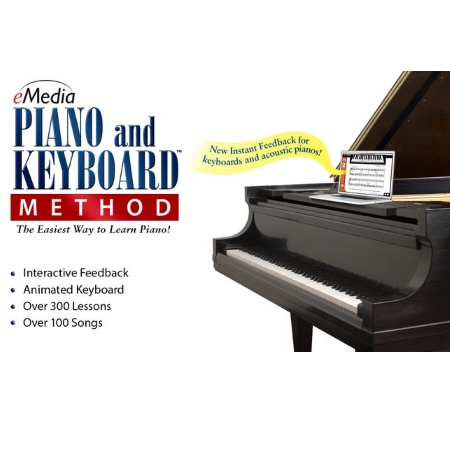 eMedia Piano and Keyboard Method includes over 100 easy piano songs, including hits from Billy Joel and Elton John, that make learning how to play piano fun! · eMedia’s Animated Keyboard that lets you see fingerings including piano chords, piano scales, and songs in all of the piano lessons. · Interactive Feedback with Note and Finger Tracker to allow the piano software to listen as you play melodies and display your playing accuracy – a great tool for beginner piano instruction that works with both electronic keyboards and acoustic pianos. · Interactive Performance Evaluation in the piano software, which highlights your playing mistakes and shows what you should have played with an overall score (MIDI keyboard required). · Lessons on piano basics like how to read piano music, playing accompaniments with piano chords, piano scales, and more. · Over 70 videos for the piano lessons are included. Split-screen views show you how to play piano fingerings and use correct hand positioning. · Piano lessons include easy piano songs that can be looped, slowed, or sped up. · Instrumental accompaniment (including orchestral and jazz) that make piano lessons fun. · A digital metronome to keep you on rhythm and a recorder to help gauge progress and share your playing with others. · 100 popular classical, blues, pop, and rock songs let you learn how to play piano with hit songs such as Billy Joel’s “Piano Man,” Bob Dylan’s “Knockin’ on Heaven’s Door,” and Elton John’s “Candle in the Wind”.